Combining two separate desert ecosystems into one national park may seem like a long shot. But within the intricate and fragile Joshua Tree National Park, this becomes reality. The park stretches roughly 800,000 acres and has been shaped by winds, sudden rainstorms and climatic extremes for thousands of years. At the “low” desert (below 3,000 feet/910 meters) – Colorado Desert – dominates the eastern half of the park. 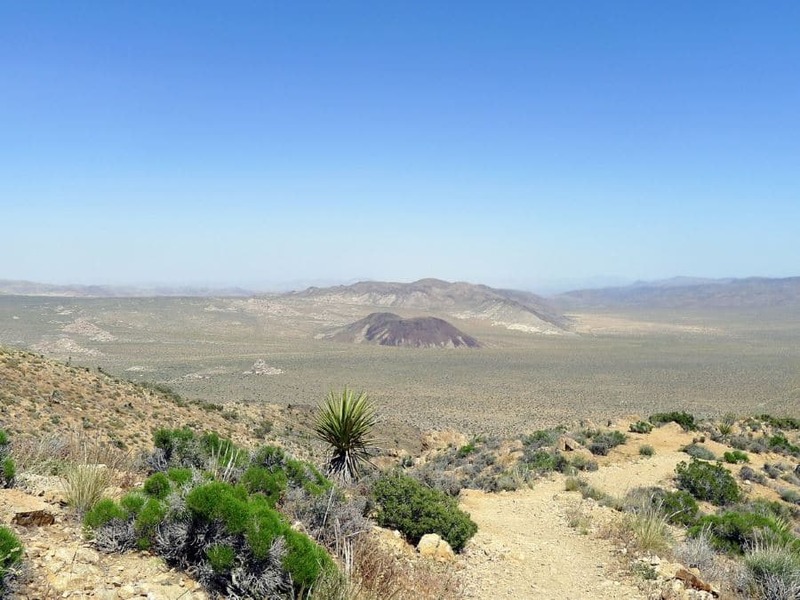 The “high” desert – Mojave Desert – is slightly cooler and wetter, and creates a special habitat in which the park’s namesake, the Joshua Tree can thrive. Interspersed between these harsh landscapes you’ll find five fan palm oases, indicating which areas of the park have naturally occurring water at the surface. These provide a welcome respite and host an abundance of wildlife. 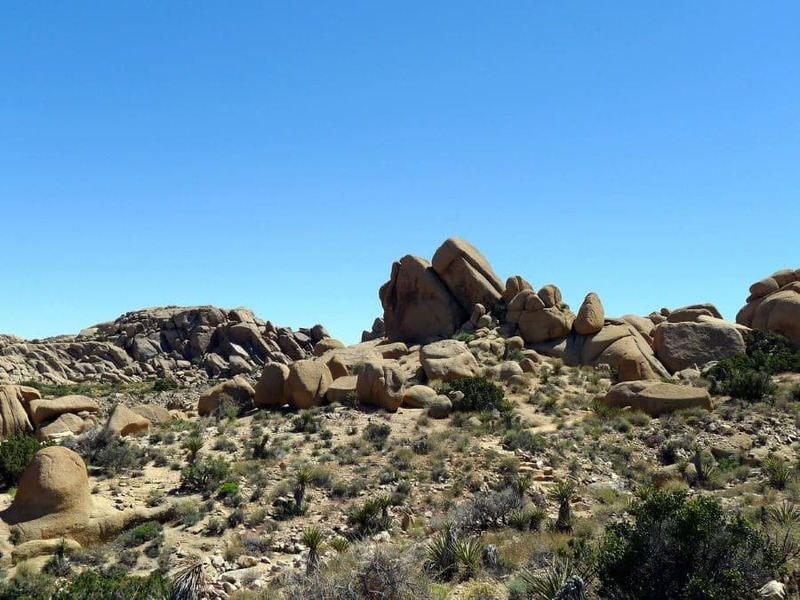 And throughout the park, visitors are welcomed by an array of interesting geological features such as twisted rugged mountains, exposed granite monolith and much more that have been changing this land for thousands of years. At the same time, relics from past inhabitants – rock paintings from Native Americans, dams from cattlemen and gold mines – are still on display throughout the park today. Joshua Tree National Park is located in southern California and features three entrances. 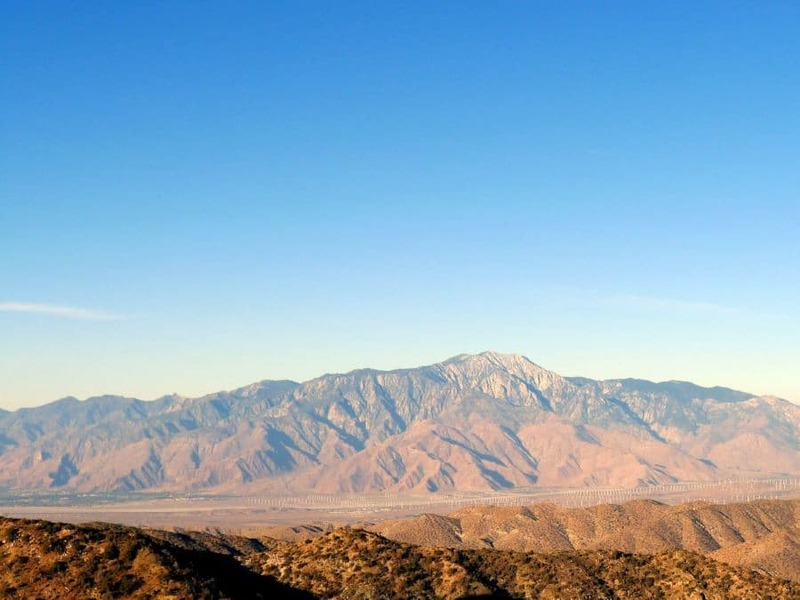 The West Entrance is roughly five miles from the junction of Highway 62 and Park Boulevard in the direction of Palm Springs and Los Angeles. The North Entrance is in Twenty Nine Palms and three miles south of the junction of Highway 62 and Utah Trail. The South Entrance is near Cottonwood Spring along Interstate 10. 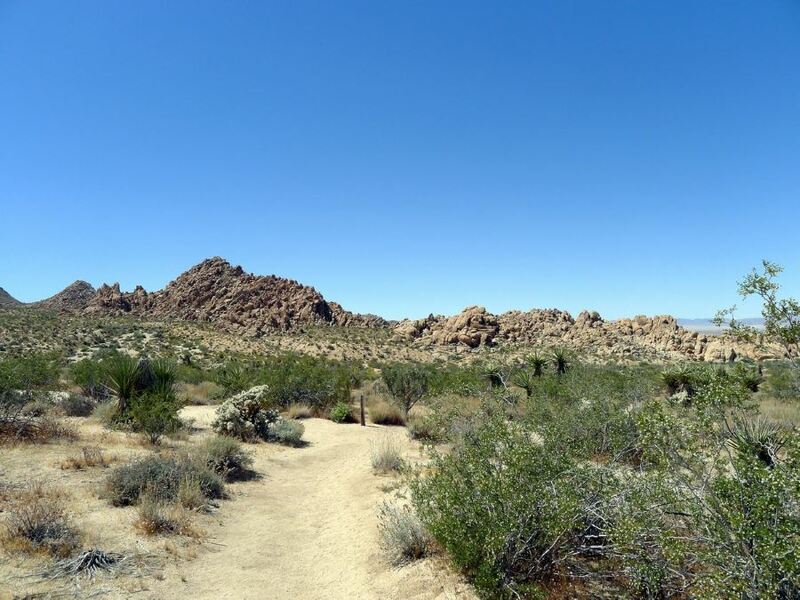 Here we’ll take you through the basic overview of hiking in Joshua Tree National Park – including how to get there, where to stay, where to eat, what to see and what to watch out for. The closest airport is Palm Springs International Airport, roughly 37 miles (59 km) from the park’s West Entrance, serving both regional and international flights. In addition it’s also possible to fly into Los Angeles International Airport, roughly 145 miles (233 km) from the park’s West Entrance. At both these airports, we recommend renting a private vehicle, as there is no public transportation to the park. Planning when to visit Joshua Tree National Park is largely dependent on what you’re looking to do. Spring is one of the best times to visit, as temperatures are mild (perfect for hiking and climbing) and the stunning wildflowers are in full bloom. However, this is also a busier time, especially on weekends, so go during the weekdays to avoid the crowds. 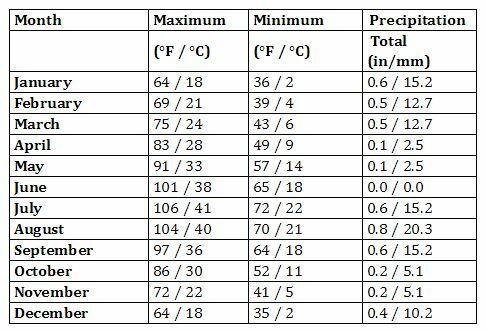 Summer is actually the least popular season due to the scorching desert temperatures that regularly exceed 100 F. During this time outdoor activities are uncomfortable (and possibly dangerous) during daytime. However, if you can manage to work everything in in the early morning or late afternoon you can enjoy limited crowds, a great campsite and spectacular stargazing. Starting from October, the temperatures start to mild out again, but there are typically less crowds than in the spring. In winter snowfall is rare, but temperatures get downright chilly, which may deter many visitors. You can also manage to score a great campground during this season. There is now a public shuttle available within Joshua Tree National Park! Check out the schedule and hopefully it can contribute to a car-free experience for you. Most people still drive to Joshua Tree. As many roads are paved, you shouldn’t any problems driving a car. In addition, the park also features many rugged back roads only suitable for high clearance and four-wheel drive vehicles. ATVs aren’t allowed in the park. 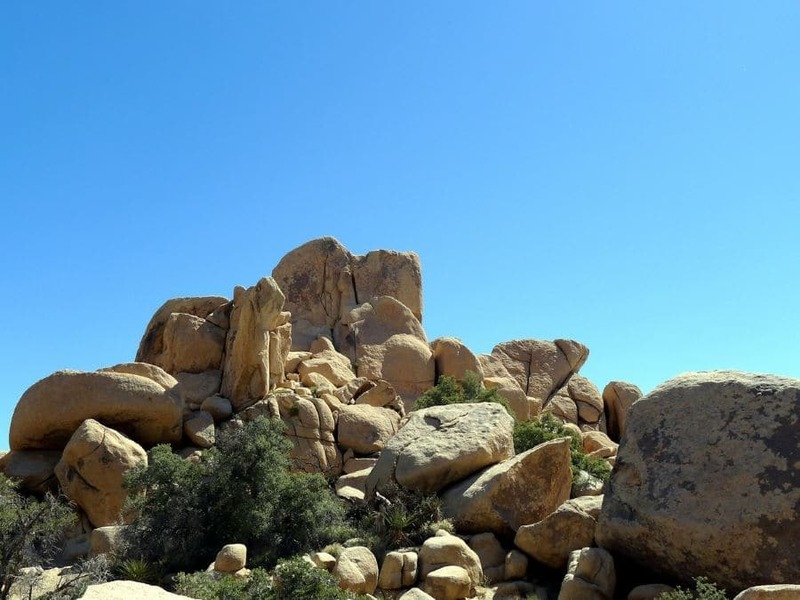 There are no lodging options located inside Joshua Tree National Park, however there are nine campgrounds available on a first-come, first-served basis. This gives you the opportunity to experience the spectacular star show, especially at campgrounds farthest from the nearby towns, namely Belle, White Tank and Cottonwood Spring. During the busier season (October to May) reservations are possible at the Black Rock and Indian Cove campgrounds. 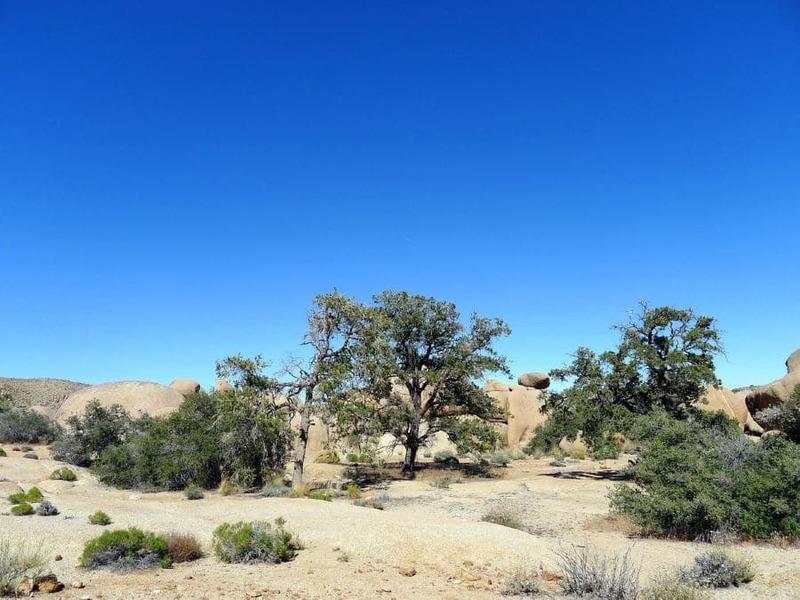 For more information on camping in Joshua Tree, please click here. Backcountry camping is also possible, but you have to register (for free!) at the Backcountry Registration Board. 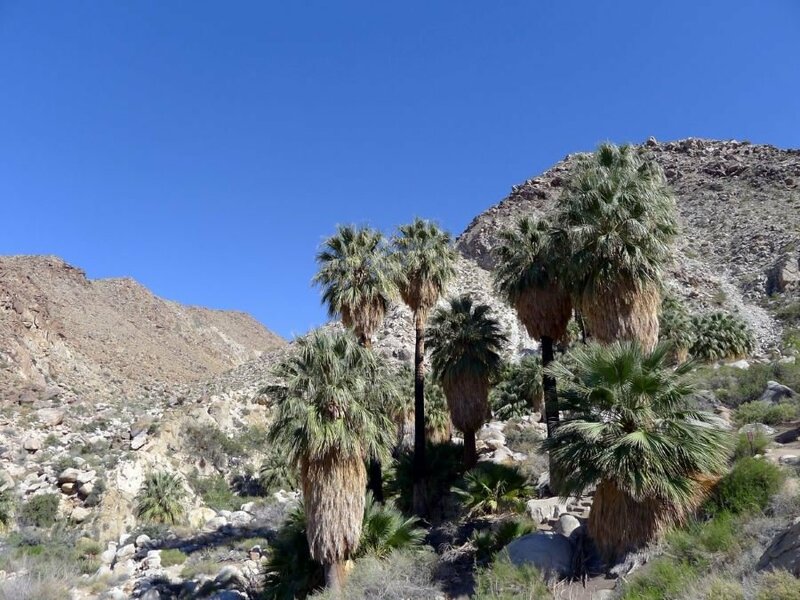 If you’re set on sleeping indoors, there are a number of towns just outside the park that offers visitors the comforts of home including: Palm Springs, Twentynine Palms, Indio, Joshua Tree, and Yucca Valley. For quick access, check out the 29 Palms Inn located right at the park’s North Entrance. Here you can find an authentic 1930s Adobe Bungalows, private guest yards, a swimming pool and restaurant – all within a stone’s throw of Joshua Tree. Just six miles from the park’s West Entrance, you’ll find the Joshua Tree Inn. Built in the hacienda style, the rooms feature a desert courtyard and direct access to the pool. Another notable place to stay is Hicksville located in the town of Joshua Tree. Here you can stay in theme-decorated trailers. 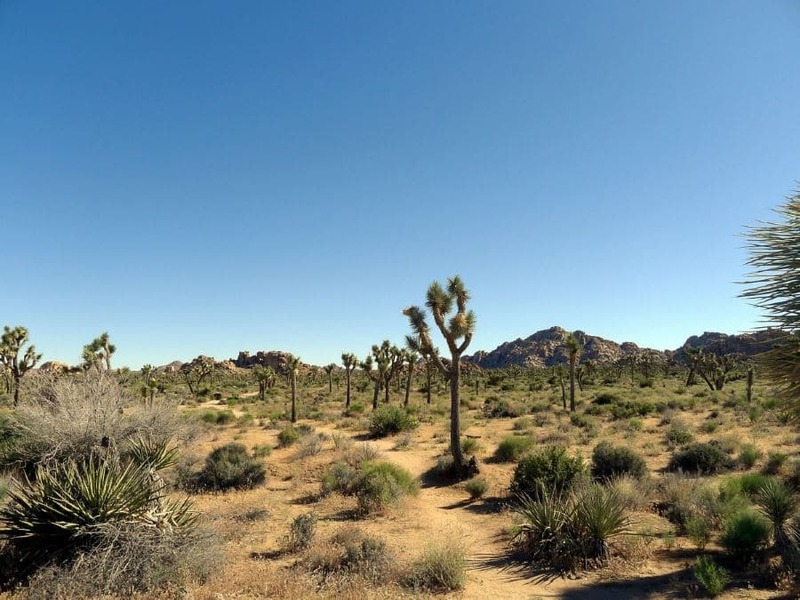 There are no restaurants or grocery stores located within Joshua Tree National Park. If you plan to eat once inside, we suggest packing a lunch and stopping at one of the eight picnic areas: Cottonwood, Indian Cove, Live Oak, Split Rock, Cap Rock, Hidden Valley, Quail Springs, and Black Rock. You can find information about restaurants and shops in the nearby towns here. 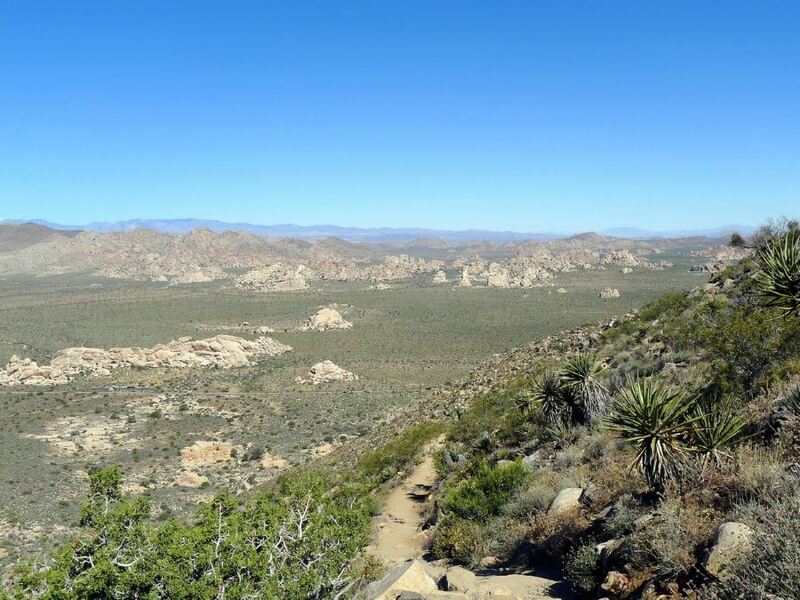 Once you’ve had your fill of hiking, there are a number of activities to keep you occupied in Joshua Tree! To learn more about the landscape, check out the 18-mile Geology Motor Tour. For more detailed information, click here. During the evening, star gazing is an absolute must-see in Joshua Tree throughout the year. Boasting some of the darkest nights in Southern California, many visitors are able to see the Milky Way for the first time in their lives here! Wildlife viewing such as birding is popular throughout the year. Depending on what season you visit, you can see a wide variety of spectacular residents, migrants, and nesters, including the road runner, mockingbird, turkey vulture and much more. There are also predatory species such as the red-tailed hawk, American kestrel, Cooper’s hawk, and prairie falcon that roam the sky! Horseback riding is also a fun activity to explore the area, and it’s possible to join a guided tour with companies such as Joshua Tree Ranch. 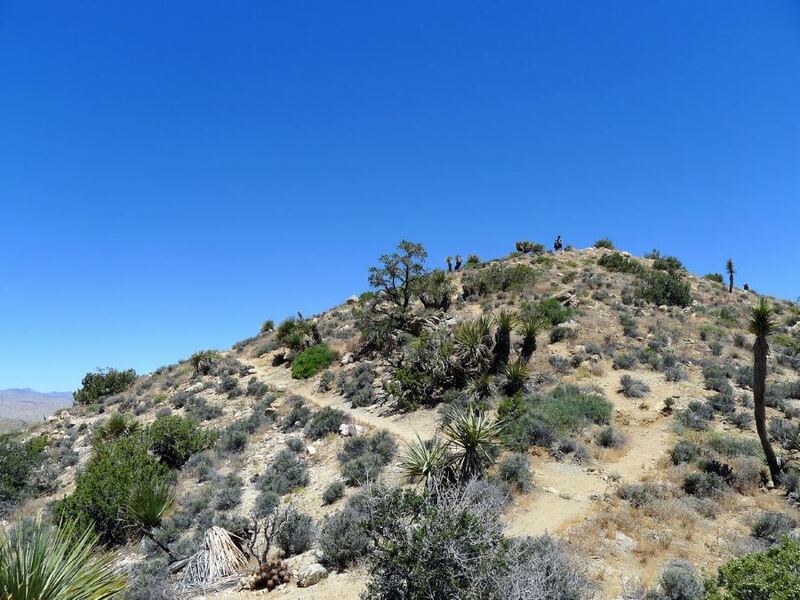 Find out more about horseback riding in Joshua Tree here. To explore up, rather than out, check out the more than 8,000 climbing routes, 2,000 boulders problems and hundreds of natural gaps. Joshua Tree National Park is a world-class destination for climbing, bouldering, highlining, and slacklining – and all levels and abilities are welcome. For a guided tour, get in touch with companies such as Joshua Tree Climbing School or Vertical Adventures. The most pressing park danger is the weather. The desert environment can create scorching daylight sun, while temperatures can drop below freezing at night. Make sure to bring at least one gallon of water per person, per day. Wear sunscreen, bring layers and stay prepared. Flash flooding can occur quickly. Avoid canyon and drainage areas during severe weather. Resident wildlife including rattlesnakes, scorpions and black widow spiders can be dangerous and poisonous. Keep and eye out, especially in rocky areas. Many old mines can be found in the park. Some are still open. Never enter the mine area as they are extremely dangerous and can have sudden drops. Desert plants also feature prickly and thorny surfaces, which should not be touched. The cost to enter Joshua Tree National Park is $30 per week for car/truck and $12 per week for a motorcycle, bicycle or pedestrian.  Find out more about park fees here. Stay cautious when driving and always obey speed limits. Speeding vehicles has killed wildlife such as the desert tortoise.